Networks Pile On Cain: Will 'Bizarre' Response to Harassment Claims 'Derail' His Campaign? All three network morning shows on Tuesday led with Herman Cain's response to allegations of sexual harassment in the 1990s and even speculated the scandal could end his candidacy, with NBC Today co-host Ann Curry proclaiming: "Damage control. Herman Cain changes his story....Will the controversy and his reaction to it derail his presidential campaign?" On ABC's Good Morning America, co-host George Stephanopoulos announced: "24-hour flip-flop. Republican front-runner Herman Cain now admits he's been accused of sexual harassment and settlements were paid. His bizarre series of conflicting interviews.... what will it mean for his campaign?" On CBS's The Early Show, correspondent Jan Crawford noted that Cain, "spent most of the day repeatedly trying to shoot down these allegations, but sometimes, his story did change. All of this is coming just as several new polls show his him solidifying his standing as the leader of the Republican pack." Today co-host Matt Lauer remarked that Cain was "finding out the hard way about the attention that goes along with being a front-runner." On Good Morning America, Karl explained that Cain "says the whole story has come to light because he is now leading in the polls." Crawford reported: "The allegations have created a media firestorm, and come as Cain is rising in the polls....Others have gone further, alleging that like then-Supreme Court nominee Clarence Thomas, Cain is the victim of a high-tech lynching." She then added: "But the reporter who broke the story denies he had any agenda other than the truth." Cain's fron-trunner status certainly seemed to play a role in the amount of media coverage of the controversy. On Monday, all three network morning shows as well as all three evening newscasts featured stories on it. ABC's Nightline also did a segment on the allegations against Cain. ANN CURRY: Damage control. 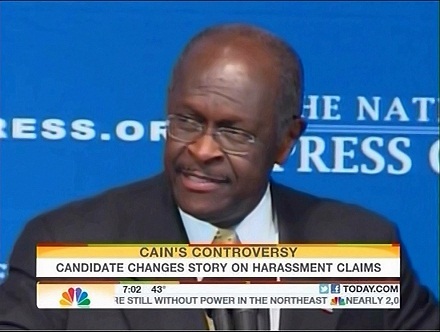 Herman Cain changes his story on those claims he sexually harassed two women back in the 1990s. Will the controversy and his reaction to it derail his presidential campaign? MATT LAUER: I think it's fair to say that Herman Cain kind of came out of nowhere to become a force in the GOP presidential race and it seems now he's finding out the hard way about the attention that goes along with being a front-runner. CURRY: That's exactly right. He spent much of the day on Monday addressing questions about sexual harassment allegations he faced nearly 20 years ago, and Cain only seemed to add to his problems as he spoke out in his own defense. What does it all mean for his campaign? We're going to get perspective this morning from NBC's Tom Brokaw straight ahead. CURRY: But let's begin with the presidential – Republican presidential contender Herman Cain and his response to allegations – accusations of sexual harassment. NBC's senior investigative correspondent Lisa Myers is in Washington with more on this story. Lisa, good morning. LISA MYERS: Hey Ann, good morning. The political storm which has engulfed Cain's candidacy shows no sign of abating. In fact, his efforts at damage control seemed to compound his problems as his story continues to shift. HERMAN CAIN [SINGING]: Amazing grace will always be my song of praise. MYERS: Herman Cain insists he's not changing his tune, but by Monday night was offering new details about an incident that may have prompted what he says were false accusations of sexual harassment. CAIN: Once I referenced this lady's height and I was standing near her and I did this saying, 'You're the same height as my wife,' because my wife is five feet tall and she comes up to my chin. This lady's five feet tall and she came up to my chin, so obviously she thought that that was too close for comfort. JUDY WOODRUFF [PBS NEWSHOUR]: Was there any behavior on your part that you think might have been inappropriate? CAIN: In my opinion, no, but as you would imagine, it's in the eye of the person who thinks that maybe I crossed the line. MYERS: NBC News has confirmed that two women accused Cain of inappropriate sexual conduct while he was CEO of the National Restaurant Association, accusing him of unwanted advances and sexually suggestive comments. At least one woman received a financial settlement. Cain's first response to the allegations on Sunday? No comment. CAIN: I'm not going to comment on that. MYERS: Then came an emphatic denial Monday at the National Press Club. MYERS: Cain first said this about a settlement. MYERS: Then on Fox, he seemed to change course. CAIN: And yes, there was some sort of settlement or termination. MYERS: And on PBS he said this. CAIN: I was aware that an agreement was reached. The word "settlement" versus the word "agreement," you know, I'm not sure what they called it. CAIN: Can you remember everything about an incident from 12 years ago? I know that there was an agreement, whether it was a settlement, agreement, or whether it was termination paper, I don't remember what it was called, so that choice of words, I'm not going to say that it's changing my tune. MYERS: Through it all, Cain claims the accusations are related to his rise to the top of many polls. CAIN: I told you this bull's eye on my back has gotten bigger. MYERS: Cain and his staff repeatedly referred reporters to the National Restaurant Association, but that group isn't talking, calling it a personnel matter that allegedly took place 15 years ago. Cain says he thinks enough has been said about this matter, and it's time to move on, but Ann, with all the inconsistency, it's hard to see that's happening quite yet. CURRY: Alright, Lisa Myers, thank you so much. GEORGE STEPHANOPOULOS: 24-hour flip-flop. Republican front-runner Herman Cain now admits he's been accused of sexual harassment and settlements were paid. His bizarre series of conflicting interviews. Cain calls it a witch hunt, insists he did nothing wrong. But what will it mean for his campaign? STEPHANOPOULOS: We begin with the latest on Herman Cain and the first crisis of his soaring campaign. He spent yesterday responding to allegations that he acted inappropriately with female employees when he headed the National Restaurant Association in the 1990s. Did the damage control do the trick? ABC's Jon Karl covered it all from Washington yesterday. And, Jon, boy, interview after interview after interview and the story changed a little bit every time. JON KARL: Well, that's right, George. And Cain is making no effort to hide from the allegations. In that blizzard of interviews and public appearances he is offering new details of what happened, some of them conflicting, and insisting he did nothing wrong. In interview after interview, Cain has been adamant, he's never sexually harassed anybody. HERMAN CAIN: The only thing that I could be guilty of saying in a group of men and women is paying a compliment to the woman. KARL: But Cain is now acknowledging that two women had accused him of sexual harassment when he was CEO of the National Restaurant Association in the late 1990s. JUDY WOODRUFF [PBS NEWSHOUR]: And what about the other woman? CAIN: The other one, I never knew that there was a claim, formally or otherwise. Totally have no idea. KARL: At first, Cain said he knew nothing about a cash settlement with the other accuser. CAIN: As far as a settlement, I am unaware of any sort of settlement. I hope it wasn't for much because I didn't do anything. KARL: But now, he says he knows about payments made at the time by the Restaurant Association. CAIN: We ended up settling for what would have been a termination settlement, quite frankly. GRETA VAN SUSTEREN: What would that be about? CAIN: Maybe three months' salary or something like that. KARL: He says the whole story has come to light because he is now leading in the polls. CAIN: I told you this bull's eye on my back has gotten bigger. We have no idea the source of this witch hunt, which is really what it is. KARL: A lot of conservatives seem to agree. RUSH LIMBAUGH: Herman Cain, obviously, is making some people nervous. KARL: Cain has been married for 43 years and has 2 adult children. His wife, Gloria, rarely appears in public. But Cain told ABC News she's solidly behind him. CAIN: She has been 200% supportive of me to date. She's been 200% supportive of me for 43 years. KARL: And Cain doesn't appear to be letting the controversy get to him. At the close of his National Press Club appearance yesterday, he agreed to sing a little. CAIN [SINGING]: I'll never know why Jesus came to love me so. KARL: After a stressful and chaotic 36 hours or so, the Cain campaign believes it has weathered the storm and can quickly move beyond this controversy. In a message sent to supporters via Twitter late last night, Cain said quote, 'I am blessed to have such great supporters. Thank you all for your support and prayers today and throughout my campaign.' And there it stands, George. STEPHANOPOULOS: Okay, there it stands for now, a lot will depend on whether we hear anything more from the National Restaurant Association. But in the meantime, Jon, no polling yet on how this might affect his campaign. But do you have any sense from the other campaigns what this might mean? KARL: Well, privately the other campaigns all say this is an indication that Cain has just not been vetted enough to really be running for President of the United States. But, George, publicly, each and every one of these campaigns has decided to stand back from this. Not saying anything about it. And I see no indications that they will come out and attack Cain over this. But they do believe that there are other issues out there. And they think this is just a sign that he's not ready to run for president. STEPHANOPOULOS: Okay, Jon Karl, we will see you. Thanks very much. CHRIS WRAGGE (voice-over) (teaser): Herman Cain fights back, saying he never sexually harassed anyone, but the GOP presidential front-runner admits financial settlements were made with two of his accusers. So what does this mean for his campaign and how will it impact the rest of the field? We're going to go live to Washington for the very latest. ERICA HILL: We begin today with GOP presidential front-runner Herman Cain, who is strongly denying charges of sexual harassment. He says he was accused of inappropriate behavior 12 years ago, and that the women involved did receive money. Political correspondent Jan Crawford is in Washington with the latest on what has become a major distraction to the Cain campaign. Part of that distraction, Jan, yesterday was the changing message. Good morning. JAN CRAWFORD: Well, that's right, Erica. He spent most of the day repeatedly trying to shoot down these allegations, but sometimes, his story did change. All of this is coming just as several new polls show his him solidifying his standing as the leader of the Republican pack. HERMAN CAIN (from speech at the National Press Club): I have never sexually harassed anyone. CAIN (from interview on Fox News Channel): I've never sexually harassed anyone. JUDY WOODRUFF (from interview on PBS's "Newshour"): Was there any behavior on your part that you think might have been inappropriate? CAIN: In my opinion, no. CRAWFORD (voice-over): The accusations against Cain date back to the 1990s, and were brought to light Sunday on the Politico website. The story says two women at the National Restaurant Association, a group Cain then led, complained he engaged in sexually-suggestive behavior. The women eventually were paid a settlement, a claim Cain initially denied. CAIN: And yes, there was some sort of settlement or termination, and I don't even know what the contents of that was, since it was found baseless. CRAWFORD: The allegations have created a media firestorm, and come as Cain is rising in the polls. CAIN: I told you this bull's eye on my back has gotten bigger. (audience laughs) I have no idea- we have no idea the source of this witch-hunt. CRAWFORD: Others have gone further, alleging that like then-Supreme Court nominee Clarence Thomas, Cain is the victim of a high-tech lynching. NIGER INNIS, CONGRESS OF RACIAL EQUALITY: You have a high-ranking black figure who dares to break away from the liberal orthodoxy, who dares to challenge the Republican elite, as well. CRAWFORD: But the reporter who broke the story denies he had any agenda other than the truth. JONATHAN MARTIN, POLITICO: I was doing my job, and reporting a story about a candidate for president of the United States who had serious allegations lodged against him. CRAWFORD: Despite the controversy swirling around him, Cain was able to lighten the mood at his National Press Club appearance. CAIN (singing): I'll never know why Jesus came to love me so. CRAWFORD (on-camera): Now, Cain said the story was designed to force him out of this race. He vowed that it wouldn't. His chief of staff told me that his supporters- Cain's supporters, were really rallying behind him, Erica. Online donations yesterday was up 75%, he said. But the question is, how long that will last if there are more disclosures? HILL: Jan Crawford in Washington this morning- Jan, thanks.